← Have you pruned your tomatoes yet? The honey super box goes on! When we installed our three-pound package of bees, we had anywhere from 10,000-12,000 bees PER HIVE! Now the population is growing on top of that at an incredible rate! 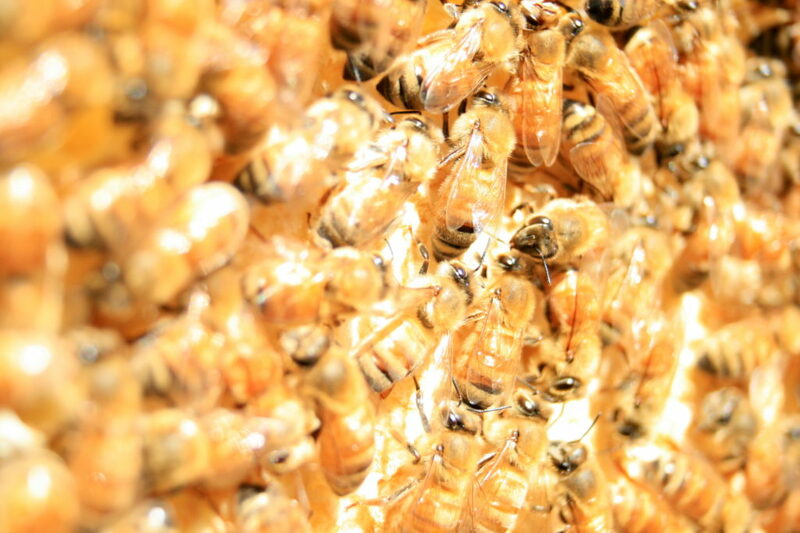 The queen bee can lay up to 2,000 eggs per day, and we know her eggs are hatching now. We’ve seen the empty cells and even watched some new bees chew off the wax capping and emerge! 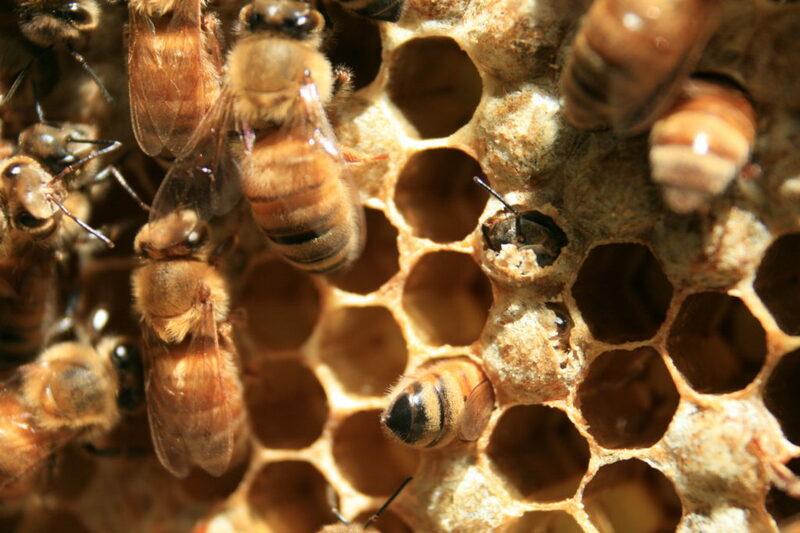 In the center of the above photo, you can see two bees chewing off the wax capping of their cell. They will soon emerge and immediately get to work cleaning the cell they just came out of. You can see a bee in the lower center of the photo doing just this, head first, deep in her cell. These three bees are surrounded by empty cells that have already hatched bees and have been cleaned so that the queen can re-use them for new eggs. All to say, we have A LOT of bees now. Every nook and cranny is full when we open up the brood boxes! We have to be very careful when we pull out a frame and set it back down; little bees are easily crushed. Being this intimate with honeybees has really made me think twice about the life of every insect I encounter this summer, especially our pollinators, whether they make honey or not! When the hive population is this big, the work gets done at an incredible pace. We had an unexpected trip that kept us out of town for about a week at the end of June. When we returned, we were very busy catching up on life, and made the mistake of putting off our hive inspection to the end of the weekend. 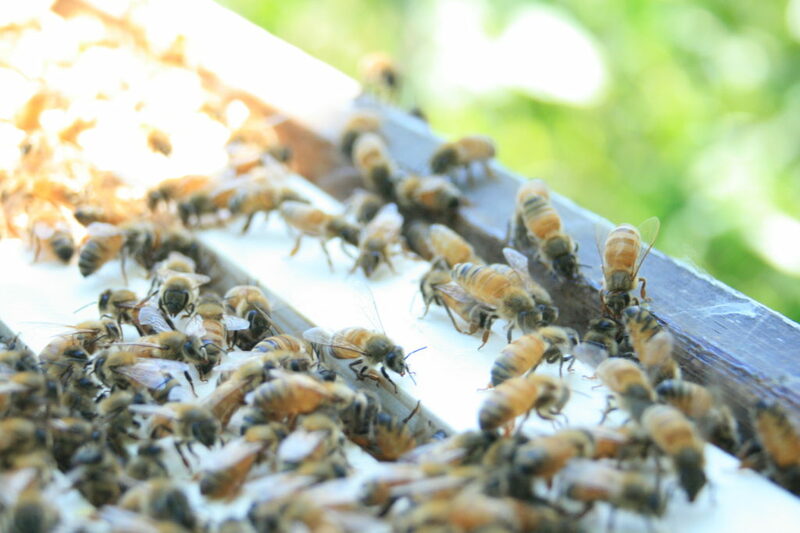 When we opened up the hive, we saw the bees were on every single frame, to the outer wall of the box. If you’re a beekeeper, you know this means they need more space, not today, but several days ago! We are lucky they didn’t swarm! 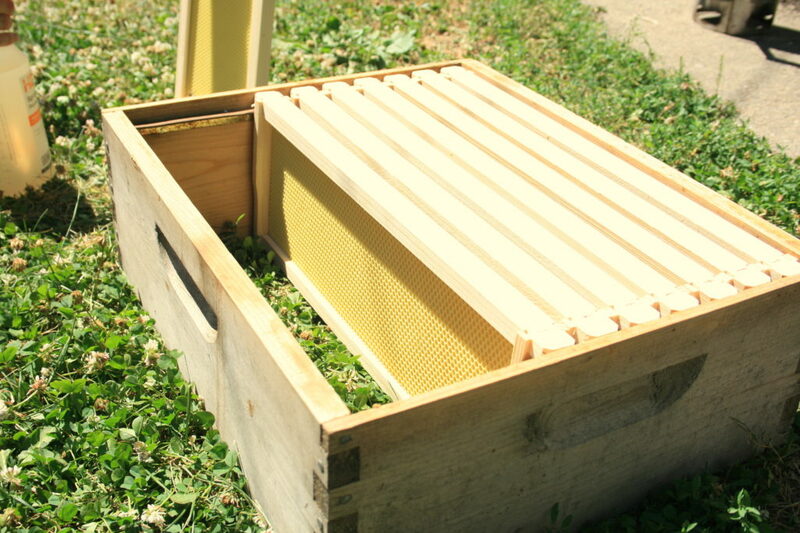 To give them more space, we put our first honey super box on. These boxes are smaller than the brood chambers because honey is dense and HEAVY! A full honey super can weigh 50 lbs or more. It amazes me that this whole box is to be filled with honey comb by these little creatures. My daughter likes to read Winnie the Pooh and whenever we do, I have to chuckle at his honey-seeking escapades. What a jackpot he would find right out our backdoor! (While luckily there are no bears in Minneapolis, bears are a real threat to country-dwelling beekeepers!) Fortunately for the bees, and unfortunately for us, this honey will not be harvested. Instead, it will be left for the bees to consume through winter. This next photo shows some of the honey stores already in the hive. Each frame usually has honey in the upper corners. 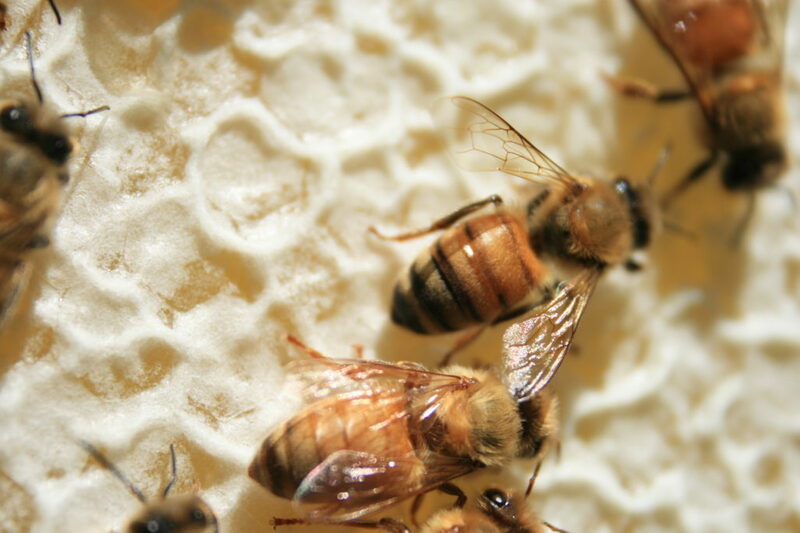 You know the nectar is done being made into honey by the bees when it has this beautiful, thin wax capping. For any new beekeepers out there feeling unsure, I want to be transparent and say that I have no idea what I’m doing, either. Really. Every time the bees do something, I’m wondering “What does that mean?” “Is that normal?” “Am I doing something wrong?” I’m a little nervous about our hives because we installed them late in the season, not until mid-May, a whole month behind when others in this area install packages. AND our bees had to draw all brand new wax comb. I’ve read it takes eight pounds of nectar to draw one pound of wax! Beekeeping isn’t straightforward. There are a lot of different ways to do a lot of different things. 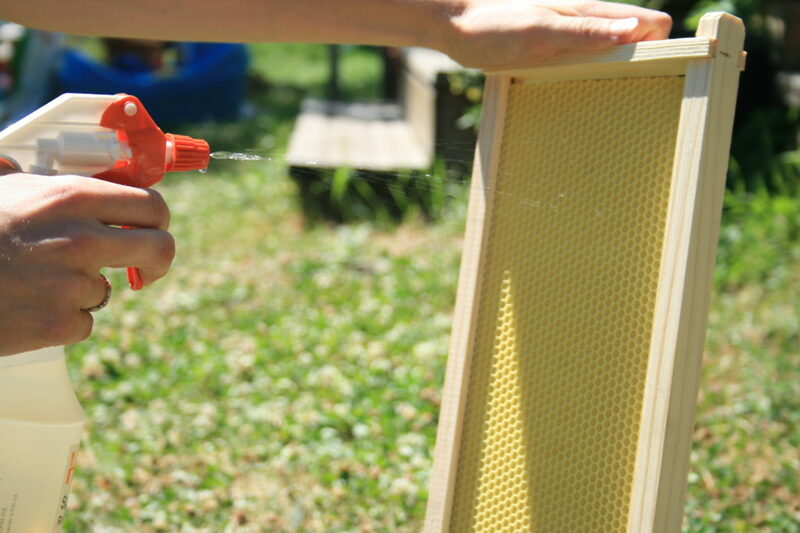 With our setbacks, we chose to feed our bees sugar syrup in the beginning, and I went ahead and sprayed these honey super frames with sugar syrup, too. This is supposed to help attract them up to the new box so they get started drawing that comb right away. 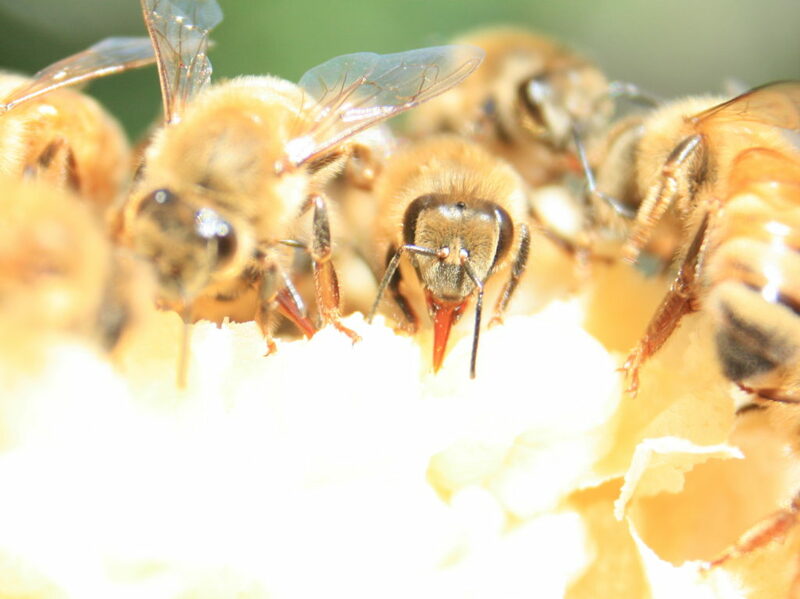 Those bees are busy (there is a real reason the phrase “busy bee” made it into our speak): wax to draw, babies to raise, nectar and pollen to process and store! It is a race against the clock, especially in MN where winter can come early and last half the year. Go bees go! I am a new beekeeper too and can relate to ” I have no idea what I am doing”. And we did have a swarm – luckily a seasoned beekeeper came at a phone call to help capture the bees. Now I have two hives – mixed feelings of yay! and goodness! It is a huge learning curve, fun and little scary. I popped in from Soulemama. Thanks for sharing your garden!